Waypoint Adventures (Nepal) Pvt. Ltd.
TSHERING SHERPA was born on Mt. Everest on August 8, 1965, the youngest of three children. At a very early age, his father relocated the family near Darjeeling, India, to work on the tea plantations. Unfortunately, his father died, leaving his mother to raise the family alone. Eventually, Tshering had to leave school to help his mother and at age fifteen, he found himself all alone. After the death of his mother, his brother took his sister to live with him in Assam. Tshering went back to the Sherpa villages on Mt. Everest. He decided to return to Nepal in hopes of getting a job in trekking. After all, he was a "Sherpa" by name. The Sherpa people migrated to the central and eastern regions of Nepal from Tibet many centuries ago. They are the best known of the high-mountain peoples and their name is synonymous with the term "mountain guide." The term "SHERPA" can refer to an ethnic group as well as a job position on a trek or expedition (If it is capitalized, it refers to an ethnic group such as in Tshering's name). He knew that the most famous of all Sherpas, Norgay Tensing Sherpa, also came from Darjeeling and accompanied Sir Edmund Hillary on the first successful expedition to the summit of Mt. Everest in 1953. After gaining 10 years of trekking experience, Tshering operated as an independent contractor for eight years. During this time, he worked as the lead guide ("sardar") for several major international trekking and touring companies. In that capacity, he has led large treks to all the popular, as well as very remote, areas of Nepal. 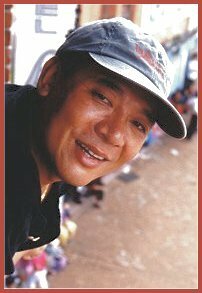 Today, Tshering Sherpa lives in Kathmandu, Nepal, and is a highly respected Himalayan trekking guide and travel consultant. He is a member of the National Mountaineering Association and the General Manager of WAYPOINT ADVENTURES (Nepal) Pvt. Ltd., a Himalayan trekking and touring company based in Kathmandu.